This Panasonic FV-05-11VKSL1 WhisperGreen Select fan allows for customizable plug and play modules that create a much more comfortable ventilation experience. This model comes standard with multi-speed with time delay operation capabilities. The Plug 'N Play module system allows for two more possible additions, including SmartAction motion sensor, condensation sensor and automatic NiteGlow LED night light. This Panasonic fan features Pick-A-Flow technology that can be switched between 50, 80 and 110 CFM settings. It comes standard with 2 easily replaceable LED lamps. 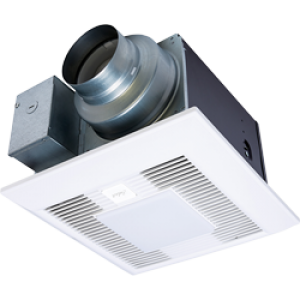 This Panasonic ventilation fan is easy to install. A Flex-Z Fast bracket system makes mounting the fan very simple and quick 3-step process. This particular model is intended for 4" and 6" ducts. Dimensions (HxWxD): 16.750" X 14.250" X 11.75"